CF® dye Annexin V conjugate is Annexin V labeled with our superior near-IR fluorescent dye. Annexin V is a 35-36 kDa protein that has a high affinity for phosphatidylserine (PS). In normal viable cells, PS is located on the cytoplasmic surface of the cell membrane. In apoptotic cells, however, PS is translocated from the inner to the outer leaflet of the plasmic membrane, making itself available for Annexin V binding. 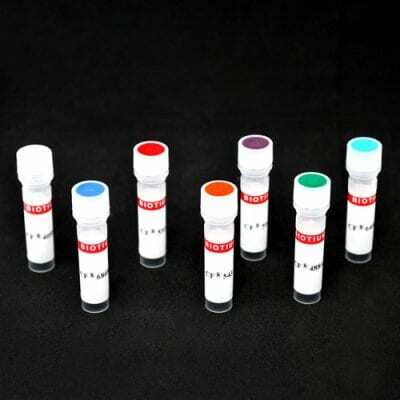 Near-IR fluorescent dyes available for this product are: CF®680, CF®680R, CF®700, CF®750, CF®770, CF®790 and CF®800. We also offer Annexin V CF® Dye Conjugates, Azide-Free, Lyophilized in colors ranging from UV to far-red. These CF® dyes are far more photostable and brighter than other similar near-IR dyes, such as Alexa Fluor® 700, Alexa Fluor® 750, Cy®7 and IRDye® 800 (download the Near-IR Dye Flyer for more information). Near-IR CF® Dye Annexin V does not contain azide or other potentially toxic materials, and thus is suitable for in vivo imaging. For more information, download our Apoptosis, Necrosis and Cell Viability Assays Brochure, CF® Dye Brochure, and Flow Cytometry Products Brochure. DiIC18(7); 1,1′-dioctadecyl-3,3,3′,3′-tetramethylindotricarbocyanine iodide. DiR is a lipophilic, near-infrared fluorescent cyanine dye. 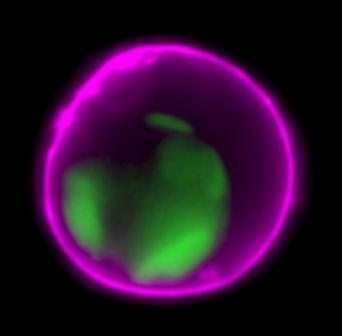 The dye is useful for labeling cytoplasmic membrane. This labeling kit comprises our superior near-IR amine-reactive CF® dye and other components necessary for carrying out antibody labeling and purification. It's available with the following CF® dyes: CF®680, CF®750, CF®770, and CF®790.